COMMENT | Look, I think it is good time that Malaysia starts to move away from the feeling of euphoria that the authoritarian Barisan Nasional government was voted out. Almost half-a-year has gone by and Pakatan Harapan needs to make sure that they make good on all their promises. Of course, the Harapan government has been doing a lot of the right things and much improvements have been made in the country. But there are also many other things that they aren’t doing properly, or just not doing at all. We, as members of the public, need to keep a detailed watch on them and hold them accountable whenever they do something wrong. For the most parts, this is happening. The public is criticising and so are many journalists. But public and media criticism can only go so far. What is really needed to complete the democratic process is a very strong opposition. And I have said this before, and many times, ever since the May 9 general election. After that election, the opposition (BN, that is) was almost destroyed and struggled for months to get back on its feet. I had called the BN to come back strong and be relevant so that there can be check and balance. The opposition, which is essentially led by Umno, needed to revamp and flush out the party. The members tried to do that in their party election, but it didn’t work. The old warlords still held on to power, maybe because they just didn’t know how to change anymore. Unfortunately, this is just more proof that the opposition is too much in tatters. They will still keep all the old farts who continue to harp on about race and religion. 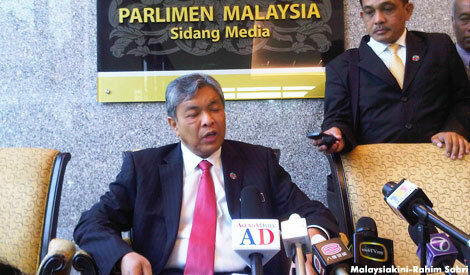 Even worse, their leader, Ahmad Zahid Hamidi, is now spewing ridiculousness out of his mouth.